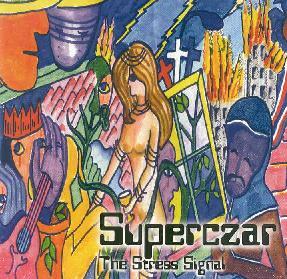 Superczar - "The Stress Signal"
The set opens with the quirky electro-pop tune "Nature". "1000 Times" is a decent rock tune. "Kiss I Send" is a catchy folk-psych song with trumpet embellishments by Master Jimmy Holland. The Jones Ave elements are still present, particularly on songs like "Sunshine Ends" and "House Of No Windows", though the electronics are certainly active players. But my favorite tracks are "Superczar", "Table Monkeys" and "Ricochets". "Superczar" and "Table Monkeys" are very cool trip-psych tunes with a pounding bassline and totally freaky acid guitar and alien synths. And "Ricochets" starts off as a song but gradually evolves into a jamming freeform psychedelic freakout that is probably the highlight of the album. A nice blend of songs and instrumental jams. For more information you can visit the Superczar web site at: http://www.stuarthamilton.f9.co.uk/sfb.